I would like to offer you my very best wishes on this special day, and thank you for your support, you most appreciated comments, and most of all for taking a few minutes of your so precious time to visit me on my blog. This morning, I would like to share with you a special card I created for a beautiful lady I met though my aunt. She wanted something unique to offer to her grand-daughter, she calls affectionately her angel, who is studying to be a nurse. Little Tilda sweetly came to me, and took me by the hand through this creating process. 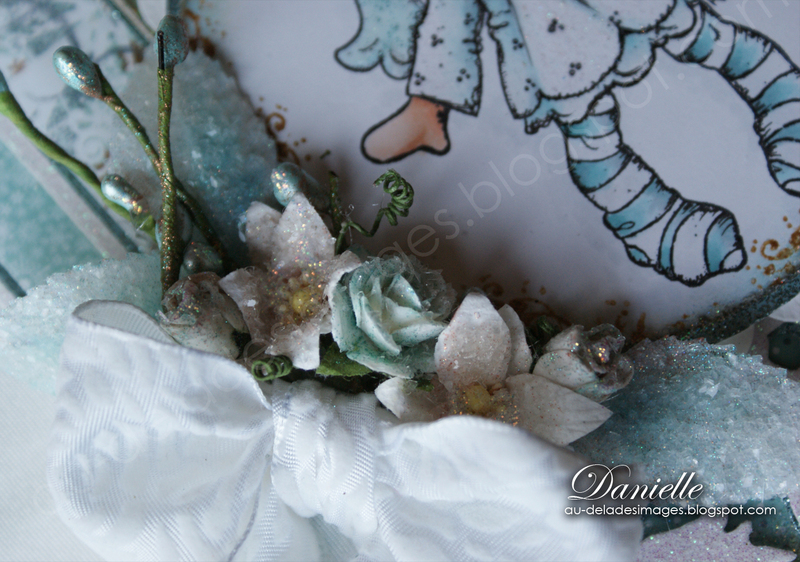 A soft world of aqua, frost and glitter surrounds my little Tilda. Je vous offre mes voeux les plus chers, et je profite de ce jour bien spécial pour vous remercier de votre fidélité à me lire, de prendre un moment de votre temps si précieux pour me laisser quelques mots, que j'adore lire! Little Tilda on x-press blending card, colored with copics. Hugs & Kisses on this Christmas day!!!!!!! un joyeux noël à toi ma grande ! j'espère qu'il t'a apporté beaucoup de bonheurs et de surprises! tu as fait un travail remarquable sur cet ensemble, comme toujours! c'est magnifique! Beautiful card, inside and out. I'm sure the "grand-daughter" will be thrilled with this. Your coloring and the extra touches look fantastic. Merry Christmas. Just beautiful Danielle! Merry Christmas! Superb card for her! I love the big bow and snowflakes and the paper is divine. You colored her so beautifully and I love the pleats in her dress, first time I have seen them on her. I love this card and awesome box set. C'est merveilleux comme ensemble, j'adore les couleurs!! !Le turquoise, le blanc, Noël et l'hiver ça m'interpelle toujours!! Passe un beau temps des fêtes Danielle!! Joyeaux Noel to you Danielle! I hope you've had a lovely day and Santa was good to you :D! Sending you my very best wishes for a peaceful holiday. I love your card and I'm sure the recipient did too, the little box, is such a wonderful ideal and I love all the diamond dust, sparkles are my favourite! Gorgeous card! I love the snowflakes. The color and design are beautiful. Merry Christmas! Merry Christmas to you and your family! There is going to be one very happy grand daughter when she receives this divine gift set . Totally breath taking beautiful! My goodness the colors and details are extra ordinary. Once again you have gone above and beyond. I love it all! Totally fantastic! OoOH yes Danielle! This is absolutely GORGEOUS and I know her Granddaughter will TREASURE this! 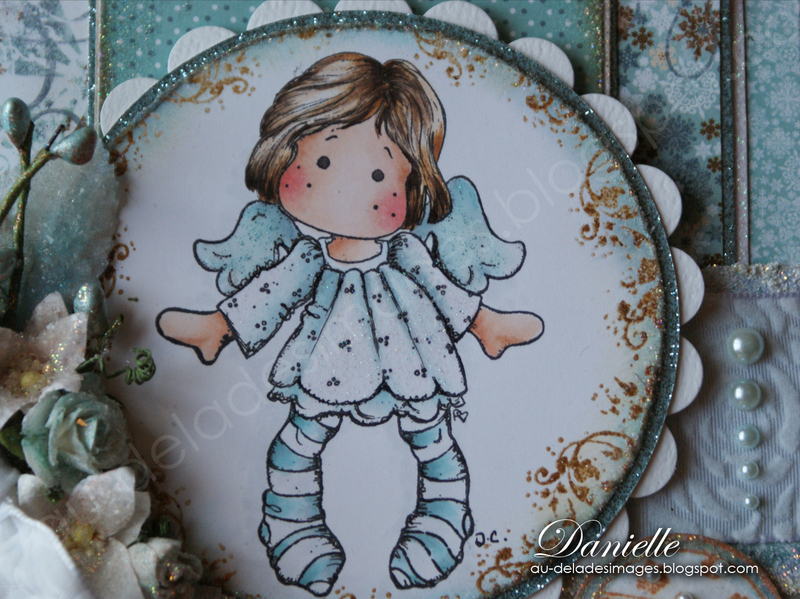 Oh my gosh, I love the colors of this sweet angel and how you've coloured her! Then all those beautiful flourishes on the side of the image, just so STUNNING!!! 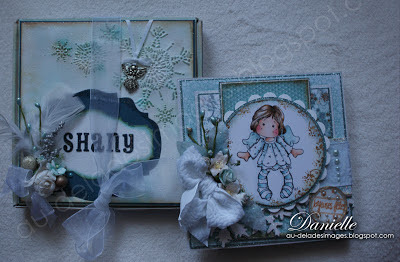 And I love all of your dry embossing!!! My gosh, it's just so GORGEOUS!! What a most INCREDIBLE set to give as a gift!!! This Tilda angel is such a cutie pie. Great colour scheme--I love shades of blue. The embossed snowflakes in the inside is just grand. And I love the distressing. OMG....what can I possibly add to all those wonderful comments??? You outdid yourself on this one....absolutely phenomenal!!! This is going to make that lucky granddaughter a very happy camper! Your presentation envelope is exquisite...love it all! Quel bel ensemble Danielle! 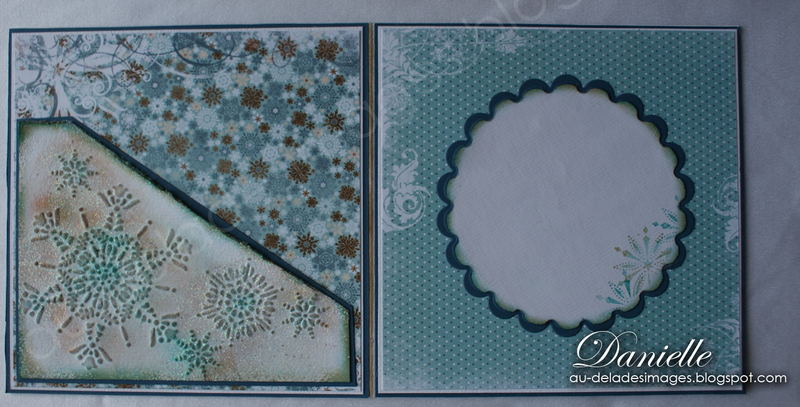 Le turquoise...j'adore!! et cette filière d'embossage... me fait vraiment de l'oeil... Tout est harmonieux! Félicitations! J'espère que Père Noël t'a gâté un peu...profites-bien de ce beau temps des Fêtes en famille! A beautiful card Danielle, stunning colours and scrumptious detailing!! Tilda is adorable (definitely my favourite for this year) gorgeous colouring!! I hope you had a wonderful Christmas and wishing you all the best for the New Year!! What a gorgeous card. I know her granddaughter will treasure it always! Happy Holidays from Texas! This is just gorgeous! I'm obsessed over her hair...it's so realistic! Gorgeous layout, beautiful papers, and Tilda is magic! What a lovely creation! Love your design and tha pretty snowflakes. Color combo is beautiful too. Happy New Year , Danielle! C'est de toute beauté Danielle... les couleurs sont si tendres, un régal pour les yeux. Bravo!!! Wow....This is JUST gorgeous!! Thank you so much for sharing it with us! 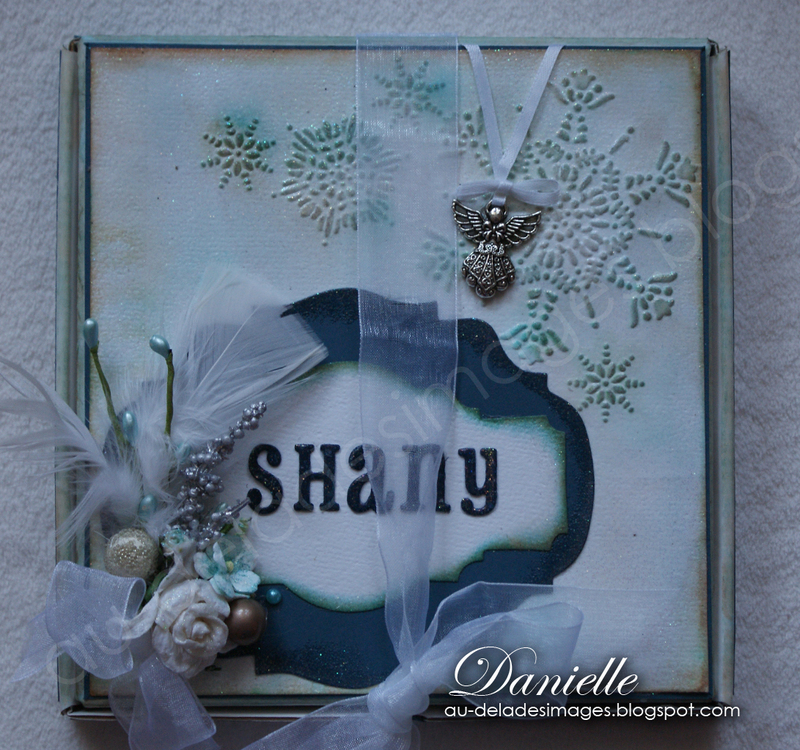 A really gorgeous creation Danielle. have a wonderful healthy New year. Je viens de m'inscrire sur ton blog car j'aime beaucoup ce que tu fais, j'en profite d'ailleurs pour te dire bravo pour tes magnifiques créations. J'adore. Petite question... sur les contours de certains de tes tamponnages Magnolia tu as des petites arabesques qui semblent tamponnées et je me demandais avec quoi tu les fais, j'ai vu ça sur plusieurs blogs Magnolia et j'adore. J'imagine que ce sont des étampes et si oui lesquelles? Merci d'avance et encore une fois bravo pour tes créations. Gorgeous Tilda Danielle! Love your coloring and sweet designing! Lovely! Oh woe is me Danielle -- I have gotten so far behind in my posts. I cannot believe how far behind I got. I was working on a very special project going into Christmas and just got behind. I am sorry --Beautifully done -- you know I have told you so many times, you are one very talented artist! WOW your project is just gorgeous!